Pieris Flaming Silver is a decorative compact growing evergreen shrub. The new growth in spring emerges bright fiery red atop the attractive silvery-white edged foliage. Clusters of of creamy white bell-shaped flowers appear in April and May. Ideal in a shady border. Height 90-100cm. Supplied in a 7.5-10 litre pot. 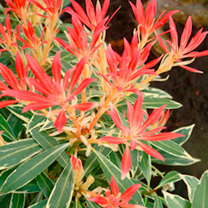 Pieris Flaming Silver is a decorative compact growing evergreen shrub. The new growth in spring emerges bright fiery red atop the attractive silvery-white edged foliage. Clusters of of creamy white bell-shaped flowers appear in April and May. Ideal in a shady border. Height 90-100cm. Supplied in a 3 litre pot or 7.5-10 litre pot.